Group D of the 2014 FIFA World Cup consisted of Uruguay, Costa Rica, England, and Italy. This was the only group to contain more than one previous winner of the World Cup, as there were three previous winners. It was also the only group with three top 10 FIFA World Ranking teams as October 2013 (ranking date for final draw) and at start of competition. Play began on 14 June and ended on 24 June 2014. Costa Rica topped the group undefeated, despite being considered underdogs and expected to easily finish last in a group containing three former winners of the competition. Two of them, England and Italy, were eliminated. ↑ The rankings of October 2013 were used for seeding for the final draw. Wikimedia Commons has media related to Uruguay and Costa Rica match at the FIFA World Cup 2014-06-14. 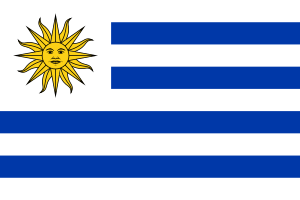 The two teams had met in eight previous matches, most recently in 2009 in the CONCACAF – CONMEBOL play-off, won by Uruguay 2–1 on aggregate to qualify for the 2010 FIFA World Cup. It was the first time Costa Rica scored three goals in a World Cup match, and also the first time Uruguay lost to a non-South American or European country in the World Cup. 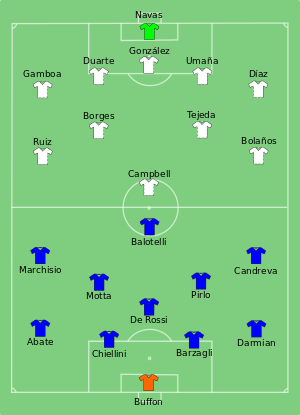 The two teams had met in nine previous matches, including twice in the FIFA World Cup (1970, group stage: Italy 0–0 Uruguay; 1990, round of 16: Italy 2–0 Uruguay). Their most recent meeting was in the 2013 FIFA Confederations Cup third place match, won by Italy 3–2 on penalties (2–2 draw after extra time). This was England's 11th goalless draw in World Cup history, more than any other nation. ↑ "2014 FIFA World Cup – Statistical Kit" (PDF). FIFA.com. p. 13. ↑ "Costa Rica's Marco Ureña completes fairytale of shock win over Uruguay". Guardian. 14 June 2014. Retrieved 30 October 2014. ↑ Smith, Ben (14 June 2014). 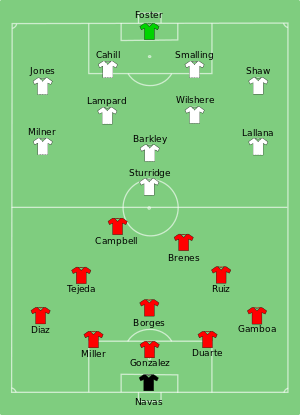 "Uruguay 1-3 Costa Rica". BBC Sport. Retrieved 15 June 2014. ↑ "Costa Rica score twice in three minutes to mount amazing comeback win against Uruguay". Yahoo! Sports. 15 June 2014. 1 2 "Referee designations for matches 5-8" (PDF). fifa.com. 12 June 2014. ↑ "2014 FIFA World Cup – Statistical Kit" (PDF). FIFA.com. p. 14. ↑ "Italy's Mario Balotelli leaves England's Group D hopes in the balance". Guardian. 15 June 2014. Retrieved 30 October 2014. ↑ McNulty, Phil (15 June 2014). 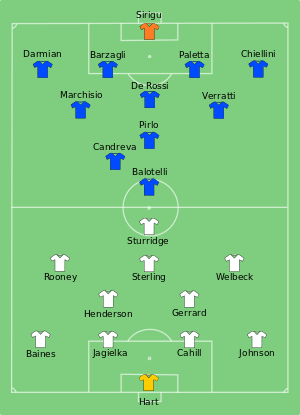 "England 1-2 Italy". BBC Sport (British Broadcasting Corporation). Retrieved 15 June 2014. ↑ "World Cup 2014: England physio Gary Lewin out of World Cup". BBC Sport. 15 June 2014. ↑ "2014 FIFA World Cup – Statistical Kit" (PDF). FIFA.com. p. 30. ↑ "Palacios, Pereira hit with one-game bans". SuperSport. 17 June 2014. Retrieved 17 June 2014. ↑ "Uruguay sink England as Suárez makes his mark". Guardian. 20 June 2014. Retrieved 30 October 2014. ↑ "Uruguay 2 England 1". BBC Sport. 19 June 2014. ↑ "2014 FIFA World Cup – Statistical Kit" (PDF). FIFA.com. p. 31. ↑ "Bryan Ruiz drives Costa Rica past Italy – and England out of tournament". Guardian. 20 June 2014. Retrieved 30 October 2014. ↑ "Italy 0 Costa Rica 1". BBC Sport. 20 June 2014. ↑ "Stellar Keylor Navas shows why Gianluigi Buffon should step aside". The National. 21 June 2014. ↑ "2014 FIFA World Cup – Statistical Kit" (PDF). FIFA.com. p. 43. ↑ "Uruguay knock Italy out of World Cup amid Luis Suárez controversy". Guardian. 24 June 2014. Retrieved 30 October 2014. 1 2 3 Borden, Sam (24 June 2014). "Apparent Bite by Luis Suárez Mars Uruguay's Victory Over Italy". The New York Times. Archived from the original on 1 July 2014. Retrieved 24 June 2014. 1 2 3 "Suarez claims 'these things happen' in biting row". ESPN. Retrieved 27 June 2014. 1 2 3 Ogden, Mark (24 June 2014). 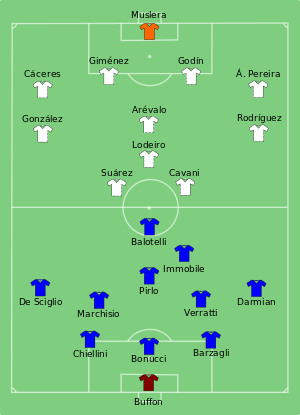 "Italy 0 Uruguay 1". BBC Sport. Archived from the original on 5 July 2014. Retrieved 25 June 2014. ↑ "FT: Italy 0 Uruguay 1". Kickoffnigeria.com. Kick Off 2014. Retrieved 25 June 2014. ↑ "Disciplinary proceedings opened against Luis Suarez". FIFA.com. 25 June 2014. Archived from the original on 25 June 2014. ↑ "Suarez's record could return to bite him". ESPN UK. 26 June 2014. 1 2 De Menezes, Jack (26 June 2014). "Luis Suarez banned: Fifa hand striker record nine-game ban AND a four month football ban for biting Giorgio Chiellini in biggest ever World Cup suspension". The Independent. Retrieved 26 June 2014. 1 2 "Luis Suárez banned for four months for biting in World Cup game". The Guardian. 26 June 2014. Archived from the original on 6 July 2014. Retrieved 26 June 2014. ↑ "FIFA Suspends and Fines Suarez for 9 Games and 4 Months After Biting Player". ABC News. 26 June 2014. ↑ "Luis Suárez suspended for nine matches and banned for four months from any football-related activity". FIFA. 26 June 2014. Archived from the original on 3 July 2014. Retrieved 30 June 2014. ↑ "Liverpool keep counsel over Suarez ban reaction". ITV News. 26 June 2014. Archived from the original on 26 June 2014. Retrieved 26 June 2014. ↑ Suárez, Luis (30 June 2014). "Suárez's official apology". Twitter. Archived from the original on 1 July 2014. Retrieved 30 June 2014. ↑ Lucas, Dan (30 June 2014). "Luis Suárez apologises to Giorgio Chiellini for World Cup bite". The Guardian. Archived from the original on 7 July 2014. Retrieved 30 June 2014. ↑ "World Cup: FIFA confirm Uruguay have appealed against Luis Suarez's biting ban". Sky Sports. 3 July 2014. Retrieved 3 July 2014. ↑ "Luis Suarez's Bite Results In Nine-Match Ban; Uruguay Will Appeal". Hartford Courant. Reuters. 26 June 2014. Archived from the original on 7 July 2014. Retrieved 3 July 2014. ↑ "Appeals of Suarez and the Uruguayan FA rejected, sanctions upheld". FIFA. 10 July 2014. Archived from the original on 11 July 2014. Retrieved 10 July 2014. ↑ "Luis Suarez's appeal against bite ban rejected by Fifa". BBC News. 10 July 2014. Archived from the original on 11 July 2014. Retrieved 10 July 2014. ↑ "FIFA rejects Luis Suarez appeal against ban for biting Giorgio Chiellini". Sky Sports. 10 July 2014. Retrieved 10 July 2014. ↑ "Luis Suarez biting appeal: CAS uphold ban, but striker can make Barcelona debut on Monday and train with new team-mates". The Independent. 14 August 2014. ↑ "2014 FIFA World Cup – Statistical Kit" (PDF). FIFA.com. p. 44. ↑ "Costa Rica 0 England 0". BBC Sport. 24 June 2014. ↑ "The full list of records broken by England at World Cup". Goal.com. 25 June 2014. ↑ "England end disappointing World Cup with barren draw against Costa Rica". Guardian. 20 June 2014. Retrieved 30 October 2014.